The past couple of months have been a whirlwind for me. I love to check the local news sites for random giveaways, because hey, you never know, right? While checking one of the station’s websites, I saw that they were accepting applications for a baking competition. I didn’t hesitate at all to apply, because it sounded pretty fun! A couple of weeks later, I got a call from someone at the station informing me that I was a finalist. First thing was first. I had to have a pie idea. I didn’t want to do anything too common, so sweet potato, pumpkin and pecan pie were all out. I brainstormed with eggnog and gingerbread, but nothing in particular really came to mind. Then I thought about chocolate. Everyone loves chocolate, but what could I do to make it more a holiday-ish. Then, it hit me….peppermint bark. Who doesn’t love the infamous chocolate/white chocolate/candy cane combination? 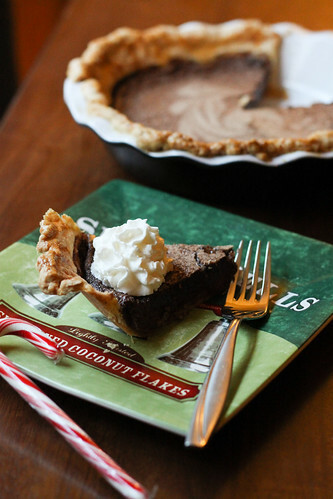 I started searching for chocolate pies online, and came across this idea for a chocolate chess pie. So, I adapted the recipe to make two pie fillings: one being chocolate, the other being white chocolate candy cane. Since the competition asked for the competitors to bake two pies, I simply put half of each filling into each pie crust (which is an amazing, flaky all butter crust…seriously, make this crust someday), and swirled them together. Then, I baked the pie up, tried a piece (hoping and praying I got the mint amount just right), and whew! I did. I brought to pies to my husband and I’s work asking for some tough love, and there really weren’t any complaints. Everyone seemed to love it! I can’t wait to share the links to the show with you all (the show aired locally last night), but for now, here’s the recipe to my competition pie. In the bowl of a stand mixer, add the flour, sugar and table salt. Mix for about 30 seconds, and then add the cold, cubed butter on top and mix everything until the butter clumps are about pea sized. Drizzle in the ice water while the mixer is on low, a little at a time, until the pie dough is just wet enough to hold together in a dough ball. Divide into two 5″ wide disks, wrap in plastic wrap and allow to chill in the fridge for about an hour or two (or overnight). While the dough is chilling, you can make the fillings. Take out two large bowls, and add 1 1/2 cups of sugar to each, as well as a pinch of salt to each. To one of the bowls, add the cocoa powder. To the other, add the candy cane dust. Whisk the dry ingredients in each bowl. In the bowl with the cocoa powder mixture, add in 1/2 stick of melted butter, 5 oz. of evaporated milk, 2 eggs and a tsp. of vanilla extract. Whisk the mixture well and set aside. In the bowl with the candy cane mixture, add in the other 1/2 stick of melted butter, the last 5 oz. of evaporated milk, melted white chocolate, the other 2 eggs and the last tsp. of vanilla extract. Whisk the mixture well. Take the pie dough disks out and roll them until they are about 1/8″ thick. Add each dough to a buttered pie dish (this is a fantastic tutorial), and then add half of the chocolate pie filling to each pie dish. After that, add half of the white chocolate candy cane filling to each pie dish. Then with a butter knife, gently swirl the two fillings (being mindful not to hit the crust). Place the pie dishes in a baking sheet, and bake the pies for 45-50 minutes. Allow the pies to cool for a couple of hours before serving (if you’d prefer to serve it warm) or after they cool, refrigerate overnight and serve cold. Serve with vanilla ice cream or whipped cream.